Rinpoche is planning to teach for a couple of days in February at Choe Khor Sum Ling in Bangalore, India. 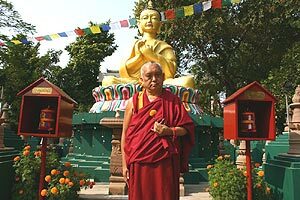 “On January 22nd, Sera Je offered Rinpoche a long life puja. Rinpoche thought He was going to a Hayagriva puja that the Monastery was offering (all day) for Maitreya Project. When Rinpoche went to attend the last session of the afternoon it was a long life puja (for many years Sera Je have been requesting for Rinpoche to accept a long life puja in appreciation for all Rinpoche has done for the monastery..especially offering food to all the monks..for the past 14 years..there are now 2600 monks taking food each day). 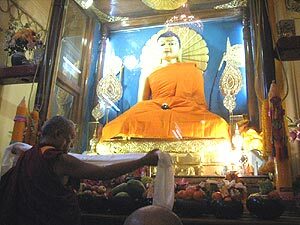 Enjoy these photos taken while Rinpoche was at Root Institute, Bodhgaya, India, in Dec 2005! Now I am back in the thrilling cold. My flight went perfect and it was quite a shock to get to Frankfurt Airport, the place looked like a space station. So clean, so much things, so “not smelly”, everything worked. I felt like a visitor from outer space, who are these people? All of them had fancy clothes, new bags, and flashy phones. Then there were golf cars and people on bicycles and weird scooters going all over the place. Then back home I met my sister, mother and father, that was great. The cold wasn’t too bad, maybe -4 celsius. Going in the car felt even weirder, no horns, no awful smell, everyone was going on one line, no garbage etc. It really felt like another planet, a science-fiction future place where everything was perfect. But when I heard people started talking again, I realized that this was not a perfect place. Maybe on the outside but not on the inside. People was complaining about which food to eat for Christmas, their cell phone doesn’t work, why does parking cost so much, they can’t record on the television, their coffee is to hot, their shoes are dirty and so on. When I went to bed I started to think about all our complaints that I heard people having today and I remembered the kids with polio in Bodhgaya that was crawling on their knees in front of me, the sick people in the clinic, the children looking for food in the garbage heaps in Delhi, the rickshaw drivers that struggled, the child with burning wounds in the clinic, the Tibetan children that I met in McLeod Ganj that had been sent over the Himalayans leaving there mothers and fathers behind, the list just goes on and on. It was too much and I cried for 20 minutes in bed when I really realized that our biggest problems are that we are afraid of eating too much Christmas food, while there are hundred of millions people around the world that live like the people in Bodhgaya, they would to anything to sit with us around the Christmas table. And I saw all the poor and sick people in front me that I have seen in India and it was just too much. I cried before I got up also today. This trip and my stay at Root definitely changed my life definitely, I was already on the way to make a big change but this trip convinced me that there is another way of living and that is the way I want to live. Not the full Buddhist path, but living with the purpose of always benefiting to others happiness and gradually make yourself and your own needs smaller and less important without going to extreme. And after have met both the Dalai Lama and Lama Zopa I saw that living such a life is not a clichï¿½ that people just think is nice to talk about living but it is really possible and definitely worthwhile! Except the part ‘not complete Buddhas path’ but benefiting others with yourself, actualizing the whole path, can’t offer deep benefit brothers, neighbors even to one self, can’t take out the very root of oceans of suffering samsara – the ignorance, cease completely the causes, the rest of the delusions and karma, need to actualize complete Mahayana path to cease subtle negative imprint. Without the positive thought when working for others a lot of emotional problems and a lot of difficulties arise. Many people are not aware of this and believe the problems come from outside: from other people and outside conditions. So only by doing that you are enlightened. Only then can you do perfect works benefiting others not a single mistake, benefiting others forever, able to bring others, the numberless suffering obscured sentient beings in full enlightenment, perfected highest bliss. OK. Enjoy the Dharma Ha Ha! The most important thing you can do in your life is to practice the lam-rim; that’s the most important thing to focus on. But that doesn’t mean only practicing meditation. Your lam-rim practice should be based upon devoting yourself correctly to your virtuous friend, who is the most important person in your life. Proper guru devotion is more important than anything else. On the basis of this you can receive all the realizations of the path and complete enlightenment; without guru devotion or practicing it incorrectly will create only obstacles and suffering. Training your mind step-by-step in the three principal aspects of the path and later, if you can, secret mantra, is like building and inner stupa, or an inner Buddha statue. Since the opportunity to create virtue and good karma, the cause of even temporary happiness, is extremely rare, those who don’t know any prayers or who don’t put the prayers they know into practice should keep in mind as purely as possible that building holy objects such as stupas, buddha statues and prayer wheels is a very powerful form of practice. Finally, if you build a Buddha statue, it should be incredibly beautiful and inspiring. Transcribed at Lama Zopa Rinpoche’s request from handwritten notes handed to Ven. Holly Ansett with the comment that they might be useful somewhere. Kachoe Dechen Ling, Aptos, CA, April 2005. Edited by Nick Ribush. 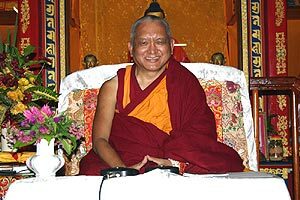 Rinpoche gave the following advice regarding implementing an idea about using the internet to connect a center’s resident geshe’s teachings live via TV/ LCD so that students at a center without a resident geshe could receive teachings. Before studying philosophy, one should start with the Lam-rim first in order to gain an introduction to Buddhism, to generate a deep understanding of Dharma, and then one can study philosophy. Or at least one should have studied the Middle Scope of Lam-rim, or studied renunciation of samsara, and then one will get the interest to learn Buddhist philosophy. We can use an internet connection with whichever center has a good interpreter. The interpreter is a key issue: when there is a good interpreter, an interpreter who has learned Dharma before, then during his/ her translation, the teaching becomes even clearer. If he/ she knows the subject well, it makes the subject even better. Even if there is a good geshe but not a good interpreter, the message cannot pass through, students cannot get the details of Dharma. Recently in the USA, there is an interpreter who is better than a geshe because he adds laughter into his translation. In general we can apply this internet connection method from any center, so that, for example, a study group can study Dharma even though it would be difficult for them to find or host a geshe locally. Some places do have difficulty in taking care of the housing for a geshe, a monthly allowance, food and so on for him. Of course it is good to have a geshe and interpreter in the center because that helps to bring people to the center for consultations, pujas, initiations, consecrations of statues and so on, not just for teaching – the geshe can help with many things, it depends on what qualities the geshe has. The quality of the geshe brings quality to the center. For an example, Geshe Lama Konchog knew astrology and knew how to check for appropriate dates. But the key issue is the Lam-rim teaching, that the geshe gives an example to people, that people get inspiration from the geshe, feel the compassion, the humbleness, experience an example of morality: there are many other benefits, not just the study itself. For new students, they should learn Lam-rim first before philosophy so that they get more energy to join the philosophy class, otherwise it is easy for them to drop out of the philosophy class. Also, we can put some basic questions and answers about the Buddha’s teaching online. Lam-rim teachings are quite good for beginners, the questions being asked are quite similar, so when people press a button on their computer, they can get an answer for their question. For philosophy it may be a bit difficult. Colophon: Rinpoche gave the following advice at Tara Melwani’s house in Singapore. 3rd May 2005. Edited by Claire Isitt, Jan 2006. NB: Some of the centers in Italy have been using the internet for live interpretation of teachings – so if any center is considering this system, do get in touch with Filippo Scianna, the Italian National Coordinator, for more information! 1. What actually happens after making requests to the deities? What do they actually do to remove obstacles, etc? LZR: It functions according to karma. How quickly (you get help or whatever) depends on your merits. It’s like when you go to the hospital whether the doctor can help or not, it depends on your karma. You need merit to meet the right doctor. Getting help from the deities or not is the same as this doctor/patient example. But how do they actually help, what do they do? LZR: Did Lama Yeshe help you? That’s the whole answer, how the buddhas help you. 2. What’s the best way to need less sleep? Remembering death? LZR: Thinking of death is the easiest way. If you think about death, and how samsara is in the nature of suffering, it works. Emptiness isn’t so easy or powerful unless you have some realization. Colophon: Questions asked and answers transcribed by Ven Wongmo, February 2005.